Kylian Mbappe will at some point in his career move to a club like Real Madrid or Barcelona, according to his Monaco teammate Fabinho. This surely comes as a big blow to Manchester United who also want to sign the French starlet. United scouts even watched him during Monaco’s 3-1 Champions League win over Manchester City. 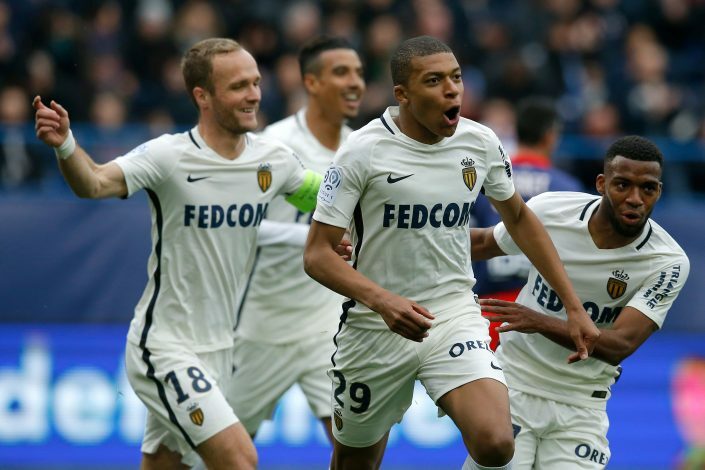 18-year-old Mbappe has caught everybody’s attention this season after grabbing 19 goals for Monaco, with a host of Europe’s top clubs reportedly interested to snap him up this summer. Fabinho admits that the teenager will eventually leave Monaco for a top club, but is hoping that it will not happen until further down the line. “We know that sooner or later he’ll go to a club like Real Madrid, Barcelona, or another club of that calibre,” Fabinho told Chuteira F.C. “But until then we’re going to enjoy him at Monaco. QUIZ: Can You Name Premier League Managers Sacked Since 2010? Mbappe’s sensational rise this season led to him making his France debut during the 3-1 win over Luxembourg on Saturday. He played the Spain friendly as well last night. Part of a front three which also had Atletico Madrid pair Antoine Griezmann and Kevin Gameiro, Mbappe’s destructive pace constantly threatened the Spanish back line and the extremely talented attacker made experienced defenders like Sergio Ramos and Gerard Pique uncomfortable on several occasions.